On April 2, 2011, I was honored to speak at Tulane Law School in New Orleans, Louisiana, as one of three panelists discussing US Energy Policy and Peak Oil. While I don't have a recording of the speech, I have included below the prepared remarks. I will post the presentation slides showing the various graphs, soon. This was an excellent event, well-attended, and run extremely well. I enjoyed meeting everyone, and having discussions on many points. I want to extend a special thank you to Mr. Wesley Rosenfeld, Tulane second-year law student for inviting me and acting as my host, also Ms. Sarah Dawkins, Tulane law student and Treasurer of the Environmental Law Society. It was a pleasure to meet and talk to Professor Oliver Houck, who had many kind things to say about the Peak Oil session. It was also a pleasure to meet and exchange views with the other panelists, Mr. John Kaufman and Professor of Law Joshua Fershee. Finally, it was a pleasure to meet our panel's moderator, Dr. Geoffrey Parker, Professor of Economic Sciences and Director of Energy Policy at Tulane University. 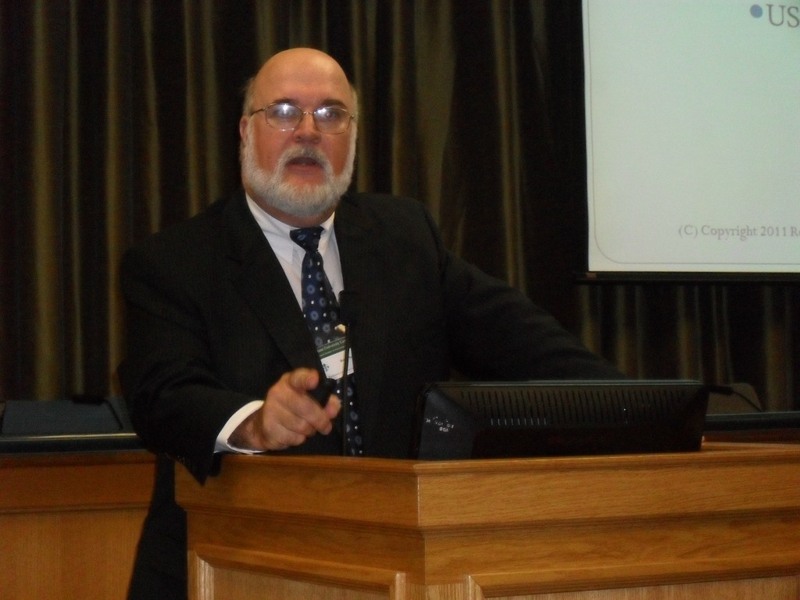 Thank you to all for making the Tulane Environmenal Law Summit a great success. Thank you, Mr. Rosenfeld for inviting me to speak today at the Tulane Law School Environmental Law Summit here in New Orleans. It’s a pleasure for me to return to New Orleans, where I worked some 30 years ago just up the river doing consulting engineering for Kaiser at the Gramercy plant. Today, I want to address a very serious issue, the US Energy Policy with respect to Peak Oil. This speech today is but a small portion, an overview, of a much longer speech I give on the topic so I’ll just hit the high points. 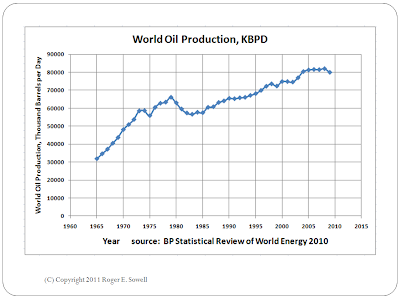 The main points are divided into two sections, Peak Oil, and Energy Policy. Under Peak Oil, I will discuss why Peak Oil predictions fail and the false model used; Oil demand is not increasing at a compound growth rate; Oil Reserves are increasing; Oil price shocks are not catastrophic; and Many more options exist today. Under Energy Policy, the main points are Take the Long View; Preserve our domestic resources; Maintain a vital oil industry; Develop Coal-to Liquids; Policy options to increase supply and decrease demand; and finally, OPEC’s new role. First, Peak Oil has always been a false prediction. I first heard the term Peak Oil in 1972 as a freshman in engineering school. It has been predicted many times since the mid-1950s yet never comes true. 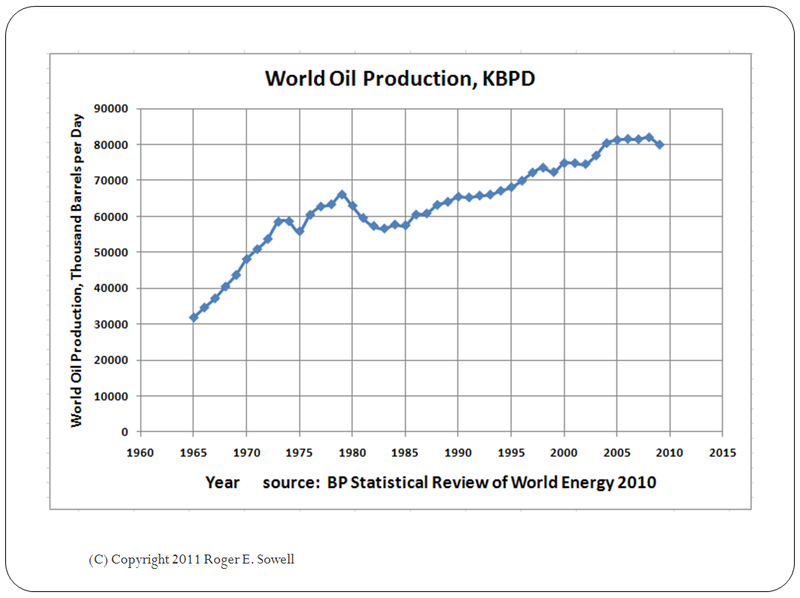 The reason is that the model that is used to forecast peak oil is false; it is wrong. To paraphrase one of the US’s most brilliant scientists, Dr. Richard Feynman, when the predictions are wrong, you must get a new model. Dr. Feynman won the Nobel prize in physics for his work in QED, quantum electro-dynamics. Second, Peak Oil proponents state that the world consumption of oil grows at an ever-increasing, compound annual growth rate or 2 or 3 percent per year. This is false, as the graph clearly shows (Figure 2). 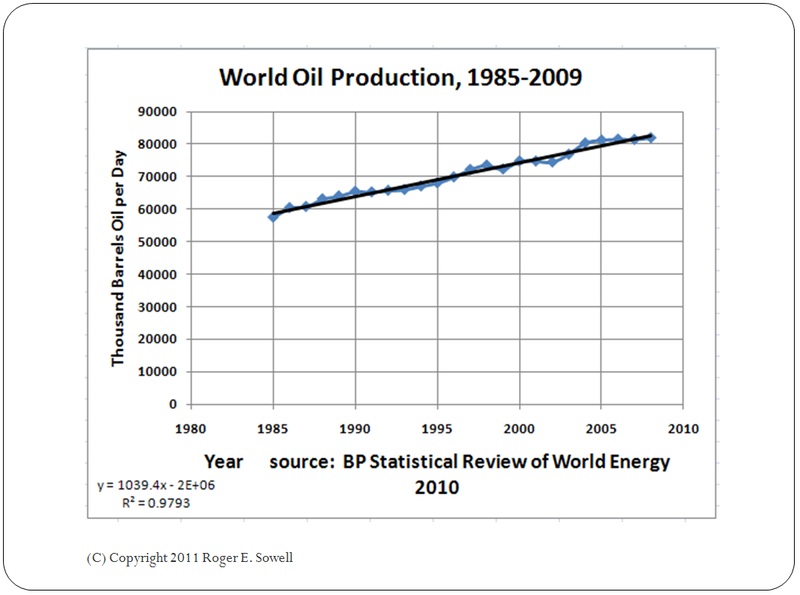 During the past 20 years or so, oil growth has been linear, at 1 million barrels per day per year. This chart shows world oil consumption by year, with two prominent peaks that coincide with OPEC oil supply disruptions in 1973 and again in 1979. The growth since 1985 has been very close to linear. This next chart (Figure 3) shows a closer view of just the data since 1985, with a linear trend line shown in black. The correlation coefficient is 0.98. 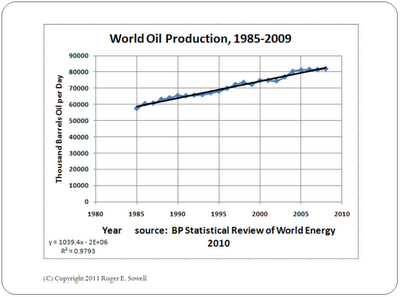 The data is taken from BP Statistical Review of World Energy 2010, and is available on their website. Other sources show similar results.Thus, we can see that there is no escalating growth in oil consumption, indeed, the past 5 years have shown a flat or zero growth rate. This is very odd, considering the growing economies and oil demand in China and India. Next, looking only at the US oil consumption data (Figure 4), we see that oil use has stabilized and is steadily decreasing since 2004. 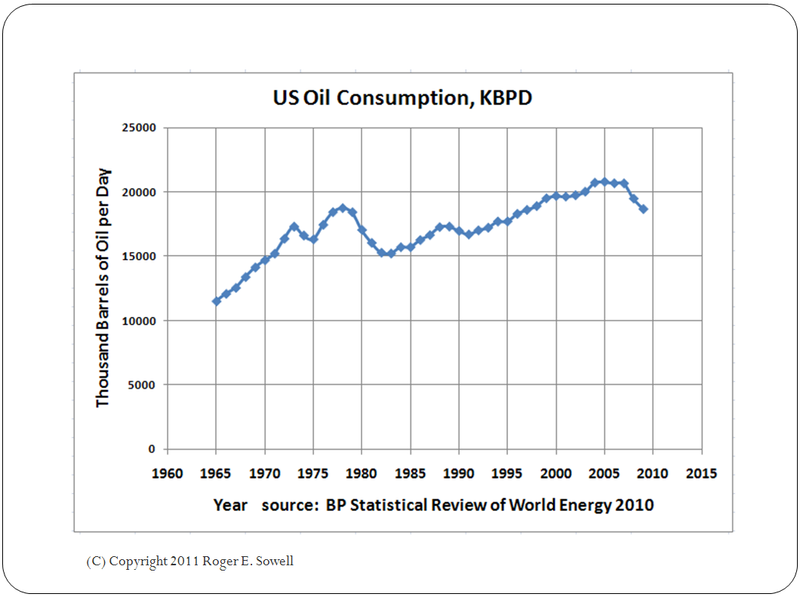 Therefore, the Peak Oil claim of ever-increasing oil use is simply not true. Third, Oil reserves are increasing, not decreasing. 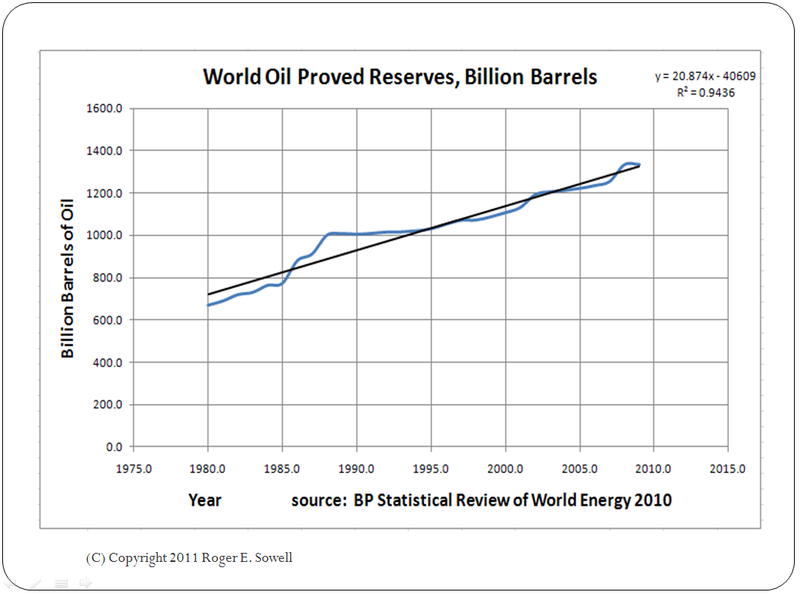 Proven oil reserves are the most-cited number, and we must recognize that these numbers are very uncertain. No one knows how much oil is in the ground. We make our best estimates and that is all we can do. But, making those best estimates, we can see from this chart (Figure 5) that proven oil reserves are increasing each year at the rate of 20 billion barrels per year. How can that be? Mostly it is due to improved oil production technologies, which I really don’t have the time to explore in detail today. Fourth, Oil price shocks are not catastrophic. The Peak Oil theory holds that all manner of calamity will occur when Peak Oil happens: economic ruin, depressions, rampant unemployment, starvation, wars for oil, etc. The price of oil is predicted to double, or triple, or go even higher.Yet, the reality is that none of those terrible things happened even though the price of oil went up 10-fold in less than a decade, in the 1970s. I lived through it, and many of you did, too. 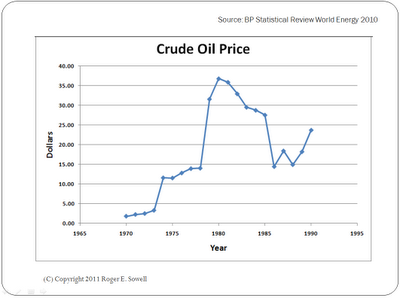 This chart (Figure 6) shows the oil price went from $3.50 per barrel to $35 between 1973 and 1980.We coped. We survived. We built better cars and conserved. 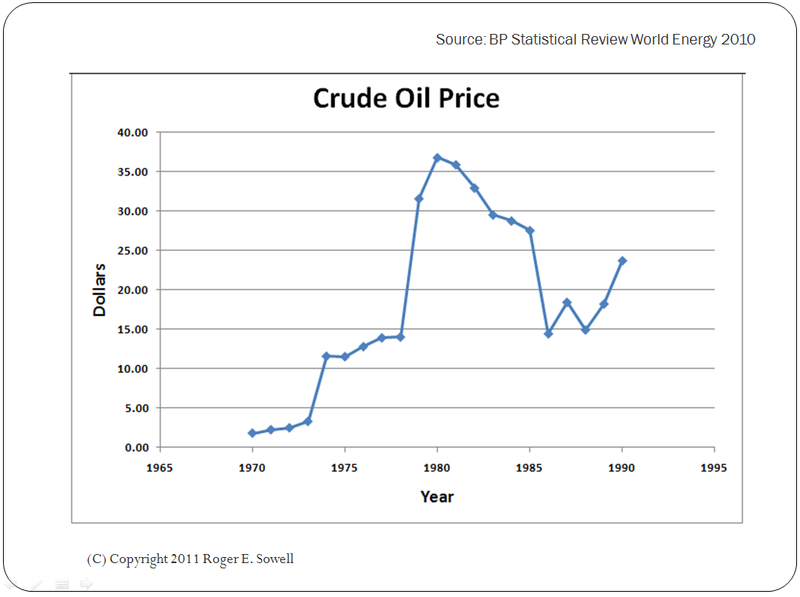 It is very instructive to examine this price chart, and while I can’t go into all the details, I can say that $32 was the price Saudi Arabia chose for oil in 1980. That was the highest price they could get without triggering the USA building our coal-to-liquids plants. However, it is a fact that today, $80 per barrel is the same as that $32 in 1980, adjusted for inflation. Saudis maintain the price by adjusting production, and bring the price down to $80 as soon as possible. This happened in 2008, most recently. If the price of oil gets much above $80, we will drill for and produce much more oil, just like we did the last time that oil price shot up.We found oil in Alaska, the North Sea, Indonesia, and other places. Therefore, we will not see a doubling of oil price ever again. The threat of converting US coal to oil is simply too real. We know how. And, we could do it. In summary, Peak Oil is not a problem. Demand is decreasing, supply is increasing, and there are far more options today. Next we must maintain a vital oil industry. It is critical that the US maintain the ability to drill, produce, refine, and transport oil and oil products to meet that dreaded day. We must attract and retain highly qualified and motivated personnel in the entire oil industry. Next, we must develop 1 million barrels per day of Coal-to Liquids production using our domestic coal reserves. The Canadians have done something similar with their oil sands, even though they lost money for the first few decades. They went up the learning curve, reduced their operating costs and now are somewhat profitable. We must do the same with our coal. Next, there are many policy options to increase supply and decrease demand. National speed limits will decrease demand by as much as 20 percent. Raising gasoline taxes are politically unpopular but will decrease demand. Mandating higher CAFÉ standards and government rebates for hybrid vehicles also decrease demand. There are many, many other policy options we could employ. By the way, the US already has more than two dozen federal laws regarding energy policy. Finally, all of the above has been based on OPEC maintaining their hold over world oil price. That is likely to change. OPEC’s new role is uncertain due to the recent events in the Middle East, particularly the change in governments in oil-producing countries. No one knows how this will all turn out, but it is very likely that the new governments will break away from OPEC and produce all the oil they can. That will decrease oil prices, in fact, we may see prices drop all the way to $20 or even $10 per barrel. 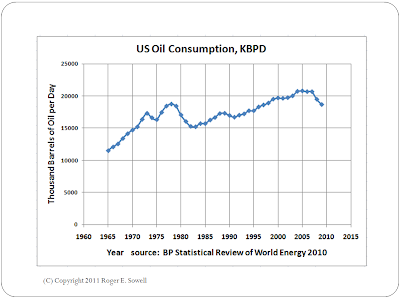 To conclude, we see that the data simply does not support the Peak Oil theory. Furthermore, even if oil were someday to be in short supply, there are many policy options to reduce oil consumption and increase oil supply. The most critical point is to not use up our domestic reserves but keep the oil in the ground as security against that day when we will need it most. Thank you, and I’ll be happy to answer any questions. -- End prepared remarks. Who do we lobby for the repeal of the corn-oil gasoline? Bhaskardancer, the ethanol mandate is a Federal law, and a repeal requires the vote of US Representatives and Senators. President Obama is unlikely to sign such a bill, rather he will veto it. There is the veto over-ride provision that allows a bill to be passed into law with a two-thirds majority vote. So, I suggest writing or faxing your US Representative and Senators to make your views known. Methanex (Vancouver BC) sells methanol, which is prepared from nat gas, for ca $1.50 per US gal Formulations of methanol have been used in racing cars for decades. Methanol has several drawbacks as a fuel such as low energy density but this is offset by the lower price. Methanol is quite poisonous but is presently used in windshield washer fluid. A main drawback as a fuel is high flash point but dimethyl ether (fp ca -40 deg C) could be added for cold weather service. The most important drawback is that methanol is a powerful and aggressive solvent. Even neoprene swells on prolonged contact with methanol. This would require essentially all metal fuel storage and delivery systems which would greatly increase costs for automotive service. Methanol is not miscible with gasoline range alkanes but is with aromatics which comprise substantal fractions of present day gasolines. Do you know if Flex Fuel cars could use formulations of methanol? While investigating something else, I found that President Eisenhower also was concerned about conserving our US resources against dire need in the future. He addressed this in his famous Farewell Address speech from January 17, 1961 (see http://www.youtube.com/watch?v=CWiIYW_fBfY ) and beginning at 11:06 into the clip. "Another factor in maintaining balance involves the element of time. As we peer into society's future, we, you and I, and our government, must AVOID the impulse to live only for today, plundering for our own ease and convenience the precious resources of tomorrow. We cannot mortgage the material assets of our grandchildren without risking the loss also of their political and spiritual heritage. We want democracy to survive for all generations to come, not to become the insolvent phantom of tomorrow." Most enlightening, Roger, thanks. I agree with your analysis. I know you're a wind power proponent, so it might interest you that Volkswagen experiments with H2 and CH4 synthesis. Their plan is to use wind power surges to produce fuels for their motors; H2 for fuel cell cars, CH4 for NatGas cars. Here's one German news article about it.